Moist to wet. Stream banks, bogs, moist clearings, wet meadows. This is a 8″ to 20″ tall, erect, annual or perennial forb. The roots are never tuberous. 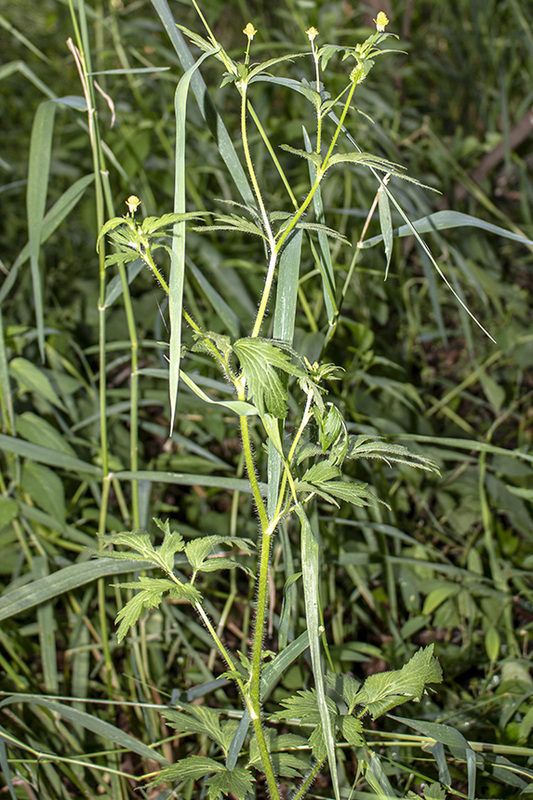 The stems are erect, branched or unbranched, and rough with firm, stiff hairs. The base is not bulbous. Basal leaves are broadly heart-shaped in outline, ⅝″ to 2¾″ long, and 1¼″ to 3½″ wide. They are on long leaf stalks that are covered with sharp, erect hairs. The leaves are divided into 3 leaflets. The terminal leaflet is on a distinct leaflet stalk. The lateral 2 leaflets may be stalked or unstalked. The leaflets are deeply divided into 3 lobes. The lobes are deeply toothed or have secondary lobes. The ultimate segments are narrowly elliptic, pointed, and have toothed margins. Basal leaves wither or dry early. Stem leaves are few and are all stalked. 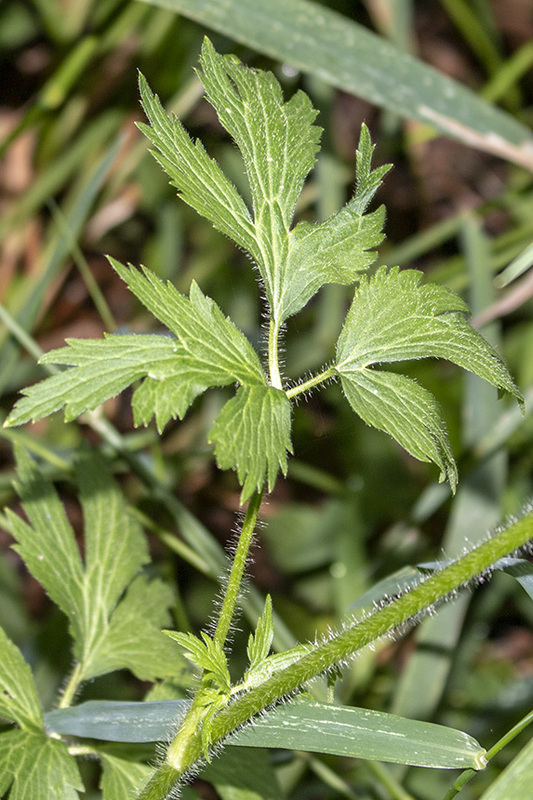 They are similar to basal leaves but smaller and on shorter leaf stalks. They get progressively smaller and shorter stalked as they ascend the stem. The inflorescence is a few solitary, short-stalked flowers at the end of the stem and branches. The flowers are ¼″ to ⅓″ wide. There are 5 sepals that bend downward, pointing to the ground, and 5 yellow, inversely egg-shaped, 1 ⁄16″ to ⅛″ long, 1 ⁄32″ to ⅛″ wide petals. The petals are shorter than the sepals. At the center of the flower there is a cluster of green carpels surrounded by a ring of stamens with yellow anthers. The fruit is an achene, borne in a 3 ⁄16″ to ¼″ wide, elongated, cylinder-shaped cluster. 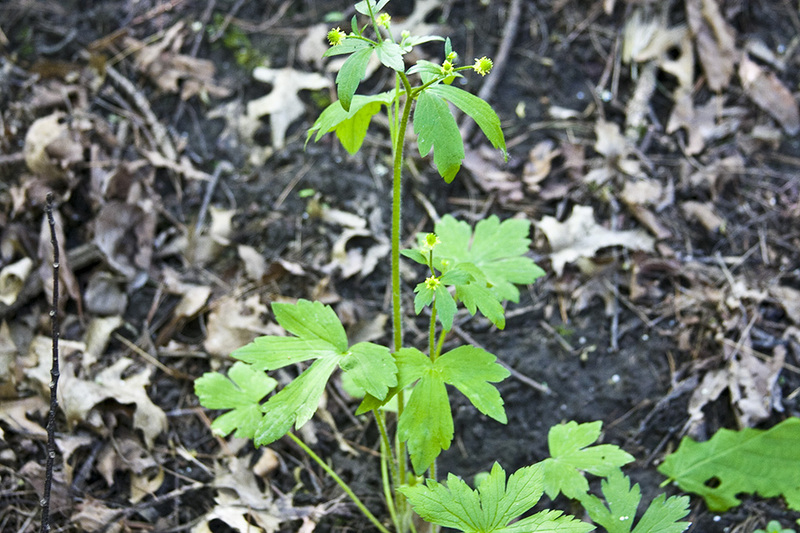 Kidney-leaved buttercup (Ranunculus abortivus) has mostly undivided, kidney-shaped basal leaves.